(Note: Unless indicated, all quotations are my translations from the author's French text  Peter Foord). In the Maigret novel Le Pendu de Saint-Pholien (Maigret and the Hundred Gibbets), Simenon sets the second half in the Belgian city of Liège where the author was born and where he spent nearly the first twenty years of his life. Now in this, his tenth Maigret novel, he locates the whole of it in his home town. 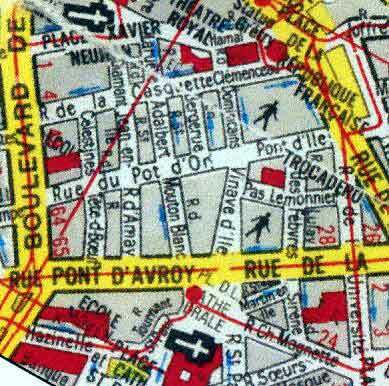 Simenon builds his fictitious plot around many autobiographical details from his early life in Liège, using the actual names of many thoroughfares and establishments without any alterations, but he does relocate two of them. The author wrote this novel in September 1931 at Ouistreham (Calvados), in Normandy. He had reached this port in the Ostrogoth, the boat that had been his home for two and a half years, and which he would soon sell. Much of the storyline takes place in October in the centre of Liège and partly in the district of Outremeuse just across the river Meuse (Map A). The novel begins inside the small nightclub, the Gai-Moulin which Simenon frequented in the early 1920s, and was located in the oldest part of the centre of Liège known as "Le Carré" (literally "The Square", not a specific intersection or open space, but an area that indicates that part of the city, a name going back to Medieval times  refer to Map B). In the novel he relocates it to the Rue du Pot d'Or instead of its real site at 8, Rue de la Sirène. This latter street is the first turning right off the Rue de la Cathédrale going towards the Rue Léopold. (When I was last in Liège, in October 2003, N° 8, Rue de la Sirène was a small modern shop offering a Thai food takeaway service). Map A - A recent map (c.1990) showing part of the centre of Liège, extending also to show part of the district of Outremeuse. 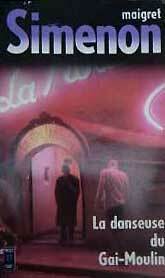 Some of those present in the night club are the main characters involved. These are the two youths, Jean Chabot, aged sixteen and a half, and René Delfosse, eighteen, with Adèle Bosquet, the dancer of the novel's title who works at the Gai-Moulin, its owner Génaro and one of its waiters, Victor. Then there is a new visitor to the night club, Ephraim Graphopoulos. Map B - A section of Map A indicating the area known as "Le Carré". Jean Chabot and his friend René Delfosse have developed a yearning to sample the nightlife and become frequent visitors to the Gai-Moulin. One of their other haunts is the Café Pélican, which existed under that name at N° 114, Rue de la Cathédrale, but relocated in the novel only a short distance away in the Rue du Pont d'Avroy. In order to finance their visits they resort to stealing money either from family members or, in the case of Jean Chabot, from his employer's petty cash. Much of the novel focuses on the activities and reactions of these two youths and their association with some of the other characters, with the author exploring the themes of human weakness, temptation and obsession. It later emerges that the nightclub's proprietor, Génaro, and Victor also have felonious activities aside from their normal work, with Adèle, the dancer, in the centre, friendly with Jean and René, but also assisting her employer and his waiter. Two sets of people with different motivations and into this situation comes Graphopoulos, the wealthy, hapless and rather naïve forty year old Greek whose own motivation is to find some activity to overcome his boredom. The author makes use of a number of autobiographical facts with the character of Jean Chabot, whose home is at 53, Rue de la Loi in the district of Outremeuse, 'just in front of the school where he had spent his early years.' The Simenon family had lived at this address from 1911 until 1917, opposite the Institut St. André, Georges' junior school. There are even appearances of two lodgers at this address, Monsieur Bogdanowsky and Mademoiselle Pauline [Feinstein], who were two of the University students lodging with the Simenons. Jean's parents even have some of the characteristics of Georges' parents. 'He's in an insurance office, I think. Accountant or something'. 'My father's ill as it is. He's got a weak heart…' '…with meticulously curled moustache'. As well as the pencilled note left in the kitchen…'You'll find a cutlet in the cabinet and a piece of tart in the cupboard. Good night. Father.' This is almost the same as a note preserved in the Fonds Simenon in Georges' father's handwriting. And there are more parallel details, which have lead to some commentators suggesting that Simenon was creating, or at least thinking about, his possible youthful alter ego. Over the years the author made reference to what he might have become if he hadn't turned to writing. He suggested that he might have followed a criminal path, fearful of having inherited some of the traits from his mother's side of the family, the Brülls, some of whom suffered alcoholism and degeneration.
' "It's time for a change, if you don't want to turn out badly like your uncle Henry…"
This is a veiled reference to Simenon's uncle Léopold Brüll. The author has stated that to rid a person from his system, he would include them, in some way, in his work. So perhaps it was more than just a thought about himself? With the accent on the two youths, Jean Chabot and René Delfosse, Simenon constructs Maigret's participation in a different way than in the previous works. Although Maigret is present at the beginning, he does not identify himself until over half way into the novel. Beyond his jurisdiction, but following Graphopoulos from Paris after the latter requested, and then attempted to evade, police protection, Maigret deliberately remains incognito, drawing suspicion upon himself. (Once more using real Liège establishments, Simenon has both of them staying at the Hotêl Moderne, which until it closed in 1976, was located at 29, Rue du Pont d'Avroy and having a meal at the same restaurant, La Bécasse, behind the Théâtre Royal, and in reality situated at 2, Rue des Dominicans). Working with his Belgian counterparts, Maigret sets up various ploys to confuse the culprit(s), not knowing what will happen. But uncertainty, incomprehension and panic on the part of those involved, leads to the unravelling of two, basically, unrelated crimes, one planned and the other unpremeditated. In the midst of the activity, the author even introduces a lighter note with one of the Belgian police Inspectors persuading his colleagues to buy pipes at a bargain price, items in which Maigret natually shows an interest. To date, there is only one English translation of this Maigret novel, that by Geoffrey Sainsbury which is somewhat wayward throughout in comparison to Simenon's French text. 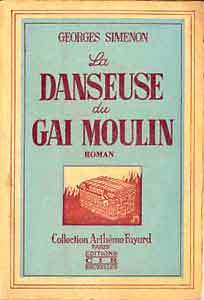 I have never had as much reason to be grateful to David Malan, my French teacher at Vale of Leven Academy, as I have in reading La Danseuse du Gai-Moulin. Chapter 5, Confrontation, seems to me to encapsulate some of the quintessential qualities of Simenon, the claustrophobic atmosphere, the mystery, the sense of unfairness and social inequality that pervades his work. When I had finished it I was moved. That was in the original French. Then I read the Geoffrey Sainsbury translation. Suddenly Simenon was made to seem flat, dull, quotidian. And I became aware of the discrepancies too. "Did you see what he had in his wallet? Any thousand-franc notes?" "A lot of them. But they were French ones. I only saw hundred-franc notes in Belgian money." Not only the grammar and sense have been changed, but also the content. This might be dismissed as a minor point, but at the end of the chapter, M. Chabot, who is obviously based on Simenon's beloved father and who is meant to be seen as a sympathetic character, is utterly traduced by Sainsbury's translation. Et le pere, battant en retraite, esquissa un pale sourire de remerciement. Jean's father, beating a lame retreat, managed to summon a sickly smile of gratitude. I would maintain that this is not a translation but a betrayal of the author's purpose. As I say, I am grateful to Mr Malan for giving me the skills to read the original version. I am now going to sell the translation on eBay. Perhaps I should add a caveat: May not reflect original accurately. 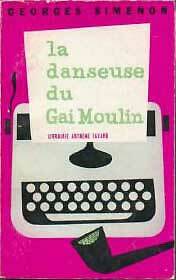 Isn't La Danseuse du Gai-Moulin a wonderful book? Not only does it take you into a world of callow youths and nightcub denizens, but it also has a wonderfully puzzling plot. Most amazingly, although it is a Maigret book, I have reached chapter 6 with no explicit mention of Maigret (although I think I know who the heavily-built Frenchman who has made several off-stage appearances is). I would be interested to know if the readers who bought the original book back in the 1930s also knew it was one of the Maigret series. It seems to me to foreshadow Simenon's move into "literary novels", which often had crime as their background, but less of the detective element.